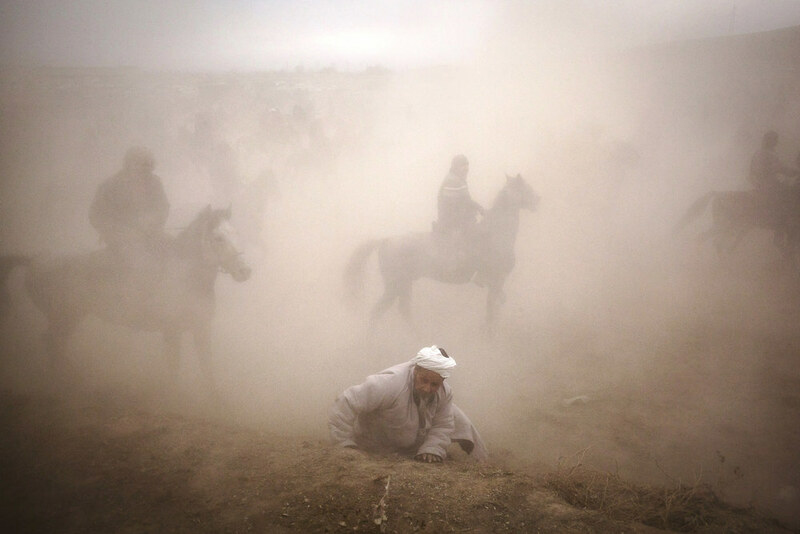 Sunlight and dust streams around Buzkashi players in Sharinav, Tajikistan. Spectators stand on a mound nearby - audience members often wander as close as possible to watch the game. 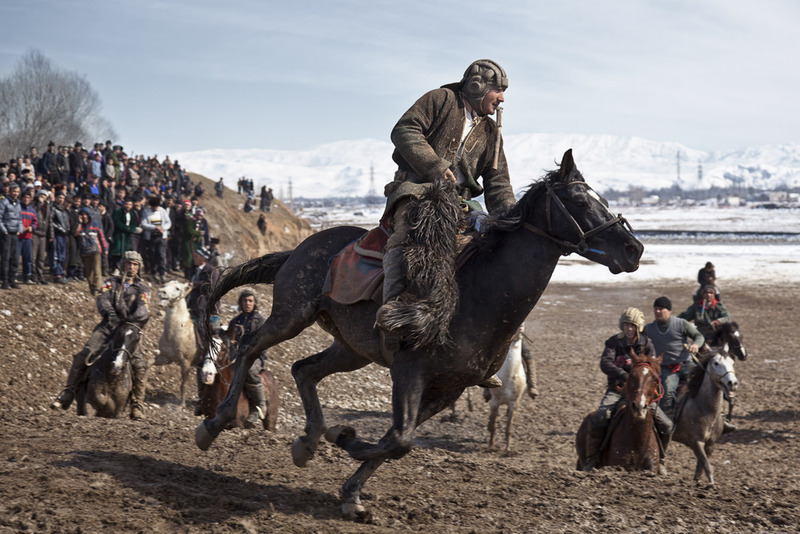 A buzkashi rider breaks free of the pack in a weekend match near Dushanbe, Tajikistan. 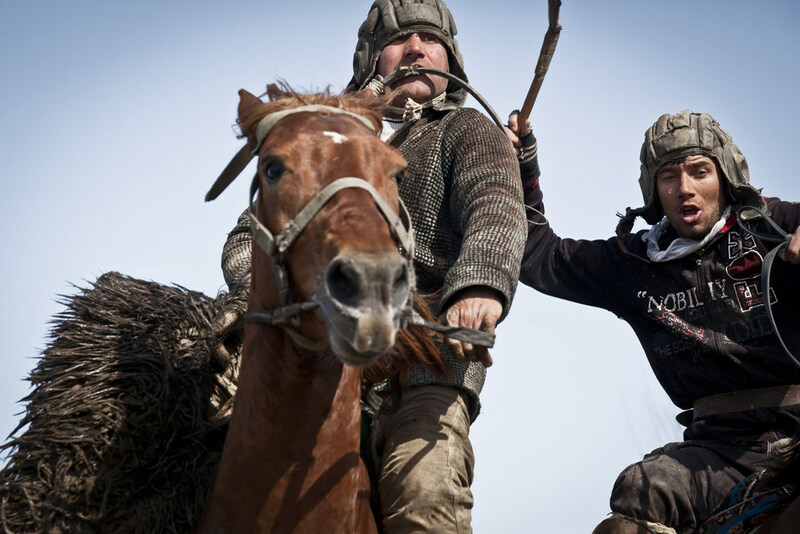 Buzkashi players fight for possession of a goat carcass in Sharinav, Tajikistan. Too slow to jump to a retreat with the rest of the audience, an old man is lost in the dust of a horde of buzkashi horses. Near Sharinav, Tajikistan. Popular throughout much of Central Asia, buzkashi is a form of horse polo in which horseback players wrestle a goat carcass across a playing field. A young boy looks on in surprise at the decapitated head of a goat, freshly slaughtered for a game of buzkashi - a sort of proto-polo played with a goat carcass, few rules and no teams. 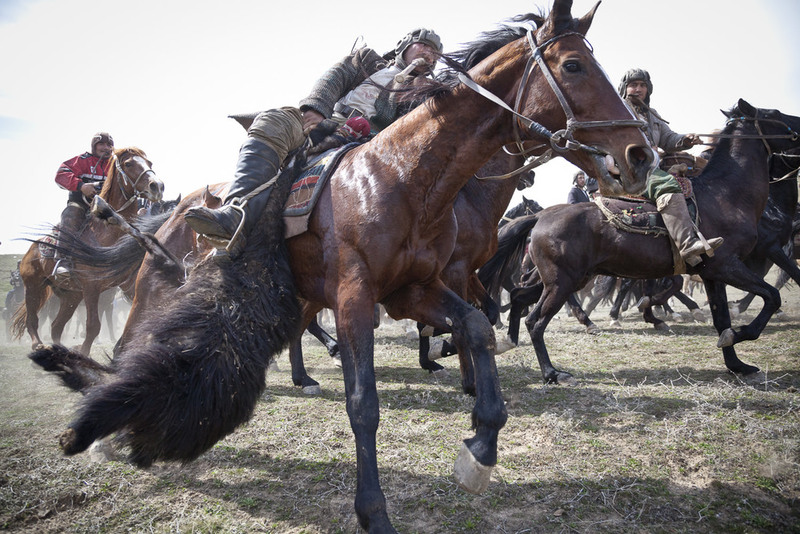 A buzkashi rider escapes from a rival with the prize. Popular throughout much of Central Asia, buzkashi is a form of horse polo in which horseback players wrestle a goat carcass across a playing field. Young spectators view a horde of buzkashi horses from a nearby hill in Dangara, southern Tajikistan. A buzkashi rider escapes from rivals with the prize goat carcass. A player puts on his boots before a match near Dushanbe. 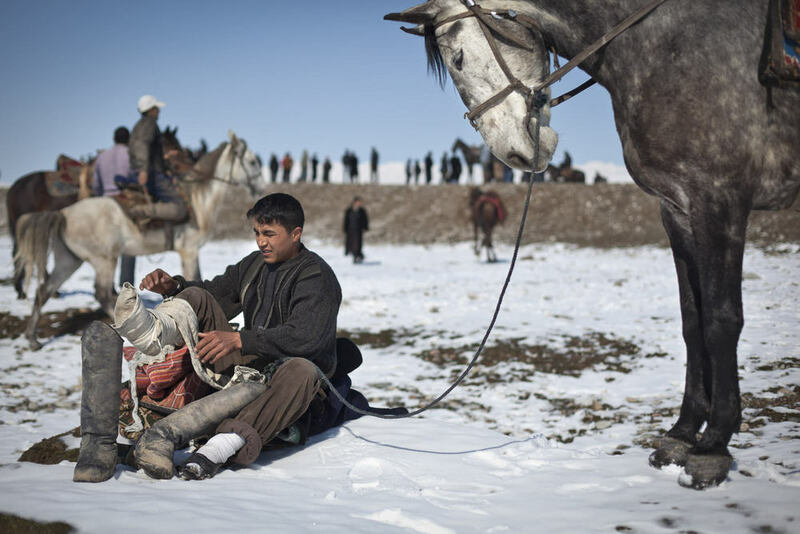 Between rounds, a buzkashi rider tapes up his hands to improve his grip, stave off the cold and ward off brutal whips from other players. Popular throughout much of Central Asia, buzkashi is a form of horse polo in which horseback players wrestle a goat carcass across a playing field. 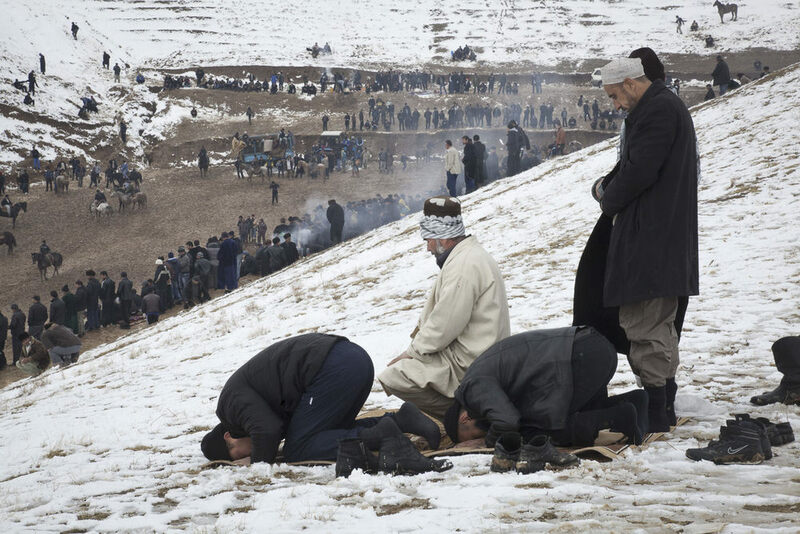 Using carpets won by the horseback riders, buzkashi fans near Hissor set aside time for afternoon prayers. 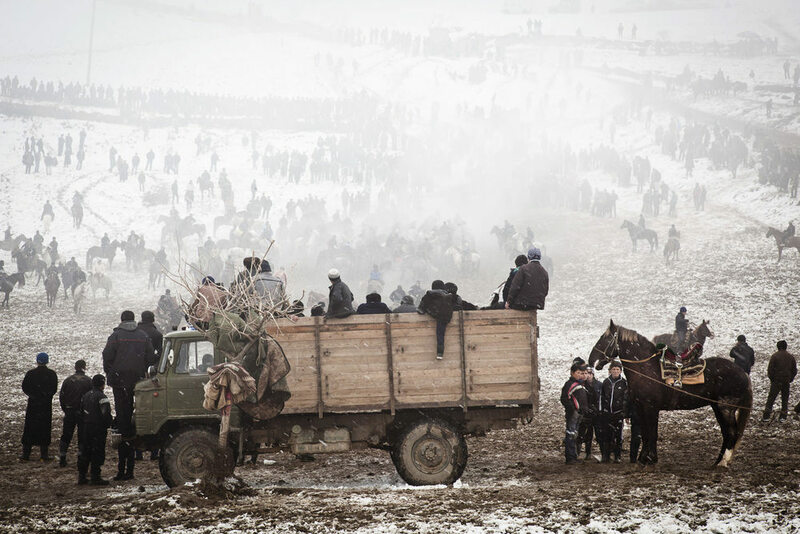 Spectators rally around a snowy buzkashi field. The truck in the foreground is both the prize truck, the announcer's truck and the holding pen for goats (buz) for the game. 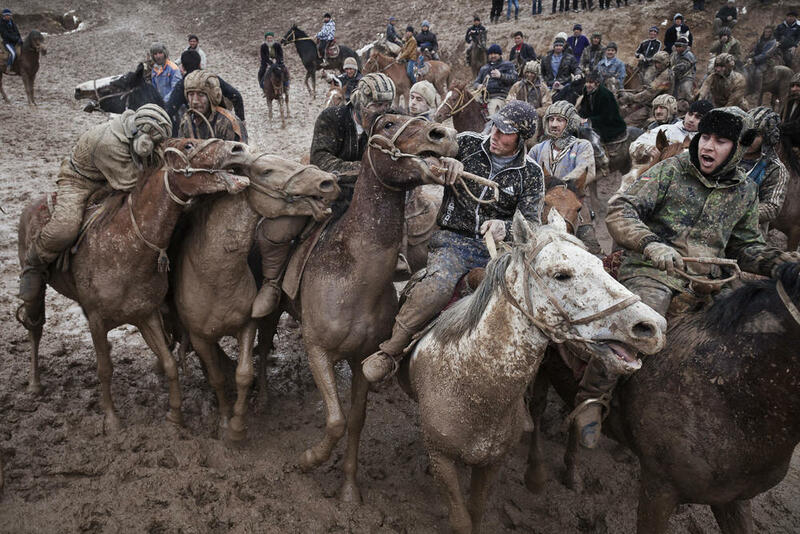 Buzkashi players fight for possession for the buz during a muddy match in Nojibolo, western Tajikistan. Tired buzkashi playing youths take rest during a muddy match. Popular throughout much of Central Asia, buzkashi is a form of horse polo in which horseback players wrestle a goat carcass across a playing field. A buzkashi rider takes a break in the fog. Buzkashi fans cluster around a truck holding competition prizes. 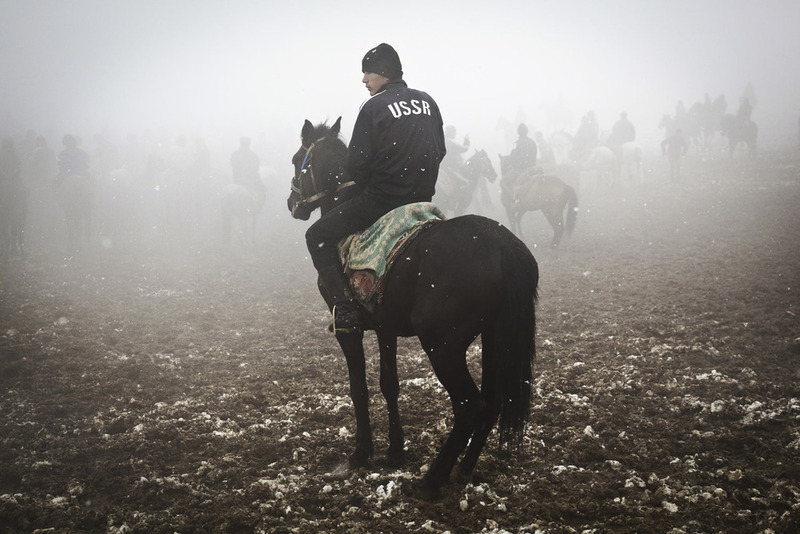 Buzkashi trainee riders exercise backup horses in the fog during a snowy match in Jirganak, Tajikistan. Young buzkashi fans hang out in a tree above horses coursing across a field during a Navruz spring match. Ahlidin, one of 5 sons in a professional buzkashi playing family, discusses the weekend's buzkashi matches with friends on his cellphone in the mountains above Dushanbe, Tajikistan's capital. Spectators look on from a high perch on top of trucks, as a chovandoz assistant carries away a carpet won as a prize during the match in Hisor, western Tajikistan. Khurshed prepares his horse for daily exercises in the mountains near his home in Dushanbe, Tajikistan's capital. 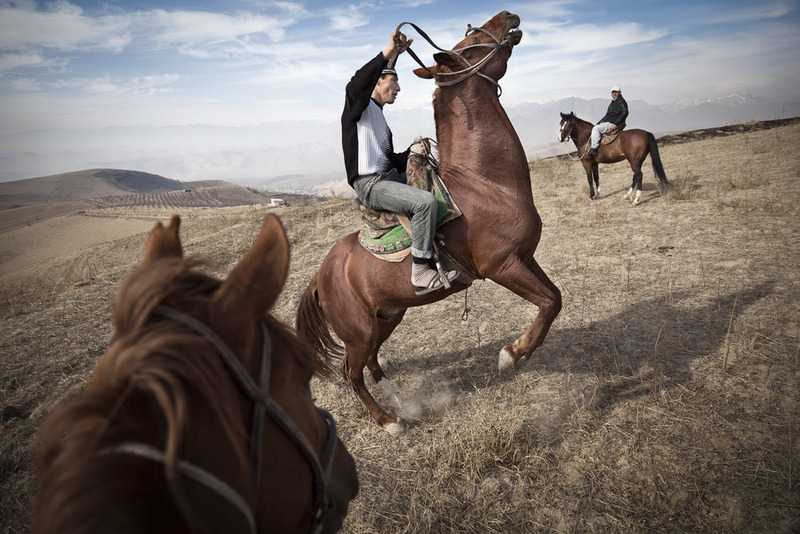 Suhrob, one of five sons in a family of professional buzkashi players exercises his horses in the mountains near Dushanbe.